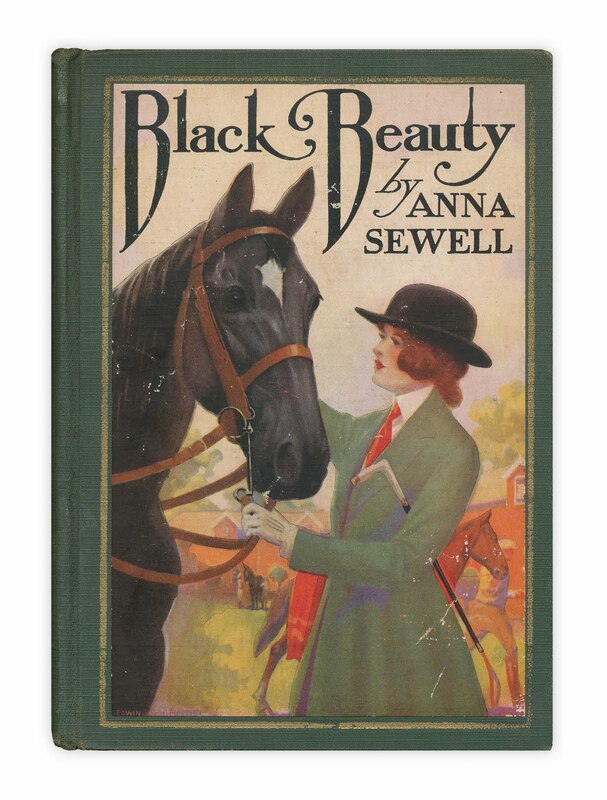 "Black Beauty" by Anna Sewell. Published by John C. Winston, 1927. Illustrations by Edward John Prittie. 14 full-page illustrations, the frontispiece is in color. Light cover wear, mostly at the upper corners. Rear portion of binding is a bit shaken, but holding tight. Contest closed; winner announced shortly. Ooohh, I'd love to win that one!! My all time favorite book...Want so bad! Please please please please please! One of my fondest memories of childhood is my grandfather reading me that book. He has since past on but Black Beauty always reminds me of him. It would be such an honor to win. Thank you for the contest. Yes, please! Thanks for giving us the opportunity to win. This was one of my favorites as a girl; I'd love to have a copy! Ima gonna comment like WHOA... so awesome! Enter me, too (on behalf of my 13-year-old equestrienne...). Thanks! The cover - I have a copy I was given by my grandfather - fifty years ago, but it was not a color cover like this one. Count me in, please. I'd like this one! I never enter your other giveaways because it would cost a lot to ship 20 books to another country :) But I've always wanted to! Oh I love books like this! Thanks for the giveaway! One of my favorite books from childhood, and with a gorgeous cover, too—thanks for the opportunity to win this book! I would love to give this book to my daughter. Thank you very much. This book is fantastic. Brings back many childhood memories! Beautiful! Thanks for offering it--I'd love to win it! Hello, my daughter loves Black Beauty - would love this copy. The cover is gorgeous! Count me in! A simply lovely book. So glad I'm able to enter now, since lately I've been unable to post! (don't know what the problem was) Thanks for another wonderful selection. That's a lovely edition! I'd love to win! Oh, my goodness. This is my mother and I's favorite book of all time. I even have the Breyer horses! Wow, just seeing the cover brings back memories. I would really love to win this! This is one of the few books I've read more than once. I had a copy as a child and, somewhere along the way, lost it. :( I loved this story. Ok, I'll bite. Entry, please! I've got a couple granddaughters that are crazy over horses right now and would love sharing this book. Oh! I re-read this so many times as a girl I can't count!